Initially, we planned to include Ubud, the centre of art and tourism, in our itinerary and but in the end we chose to stay one-night at Mara River Safari Lodge which was nestled inside Bali Safari and Marine Park. A destination that all of us, especially Dot, had been looking forward to during our Bali journey. Took a picture before the Mara Safari staff drove us on this to our room. 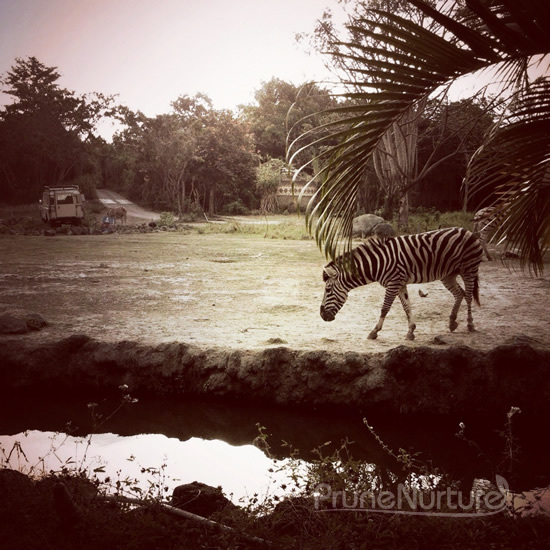 It was one and a half hour drive from Kintamani to Mara River Safari Lodge. As we travelled down south to Gianyar, we passed by many padi fields and farms. During the journey, our driver shared with us his life in Bali – the high education cost, his family and his life as a farmer even though he studied economics. He mentioned something that makes me grateful for what we have. We are very fortunate to be able to travel out of the red dot to the see the world. Others may not be able to. 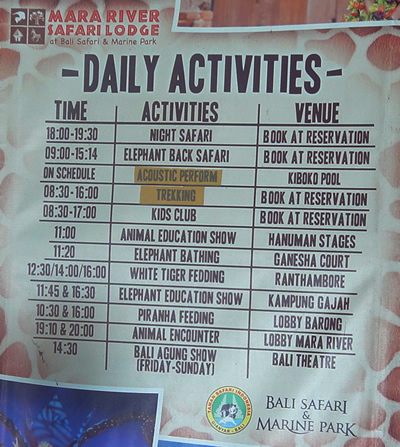 Finally we reached the main entrance of Bali Safari and Marine Park at about 11am. After notifying the staff that we would like to check-in to Mara River Safari Lodge, a van came shortly to pick us up. It was a good decision that we had decided to leave early for Mara River Safari Lodge because there are many activities in park which we would have missed if we checked-in late as we only stayed for a night. We quickly headed for the Elephant show after we dropped our luggage and bags. The show was almost fully packed when we were there. We were very impressed with performance by the cast and the elephants and the conservation message. There was time where the host invited the audience to have some close contact with the elephant. After some nudging from me, Jay raised his hand to volunteer and he was selected by the host to go on stage. After the show, we went up the stage to have photo time with one of the smaller elephants. The big ones were too big for our comfort. This naughty elephant kept trying to take my bag and the leaflet in my hands. On our way to Uma restaurant for our lunch , we visited the white tigers. The concept of this restaurant is like Marché in Singapore. I ordered the pasta and it was really delicious! After lunch, we went on a Safari journey to watch the animals from the tram. The variety of animals are not as many as that in Singapore but still it was a good experience to go on a trail on a tram. Dot had her taste of taking pictures of the animals from the tram and these are some of her shots which I thought was pretty good. 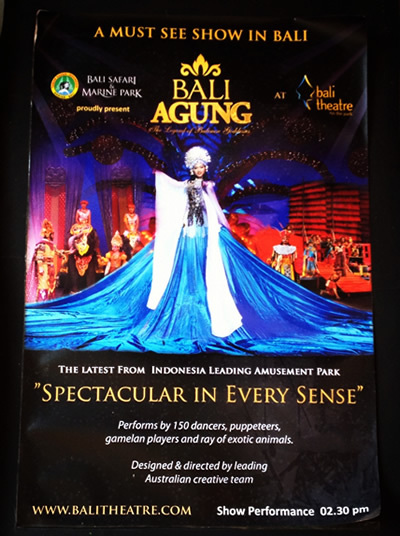 As there was only one “Bali Agung” show for that day, we decided to go ahead to watch this beautiful production at the Bali Theatre after our Safari journey. The show lasted for an hour and the beautiful cast put up an impressive performance that kept Dot’s attention for that full hour. Even after the show, Dot wanted to watch more of it. One of the best stage performance I had watched so far. 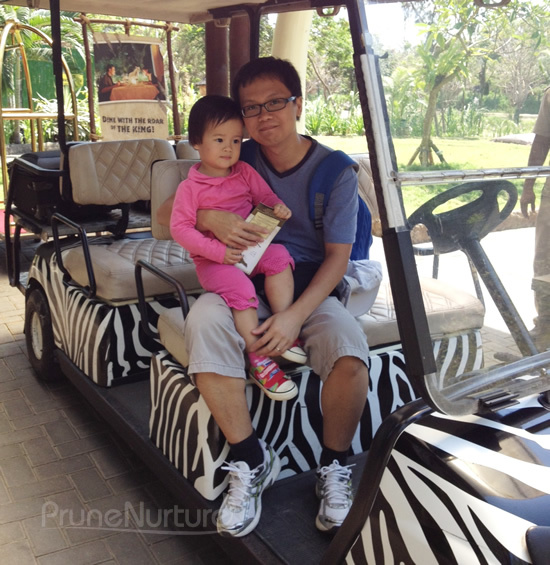 A “MUST WATCH” if you are at Bali Safari & Marine Park! 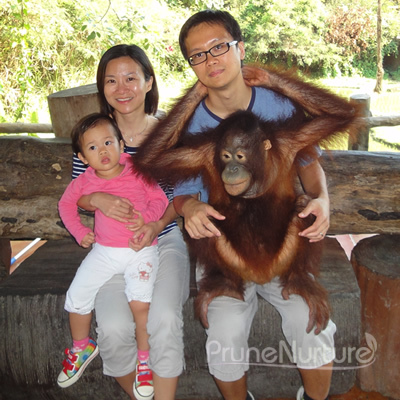 We had a photo-shoot with the orangutan and Dot was brave enough to touch it. An eventful day. We went back to our room for Dot to nap while we took a rest. 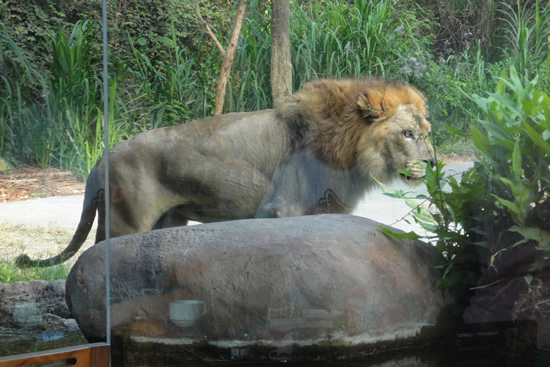 Thereafter, we had dinner at Tsavo Lion Restaurant where we saw the lion and lioness up close with just glass panels separating us. We had good breakfast at Tsavo Lion Restaurant. Thank God we found porridge for Dot so she could quickly wolf down her food before we had our last visit and walk around the park before we checked out. I took this picture from where we sat during breakfast. 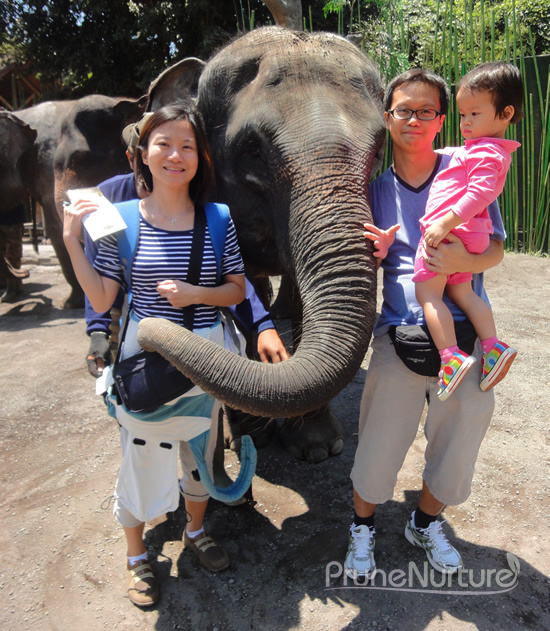 The lodge gave us a basket of carrots which we had yet to feed the animals so before we left we brought Dot to feed the elephant and my brave girl happily fed the huge elephant. 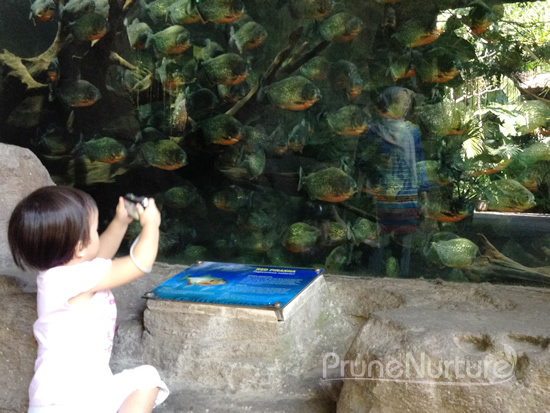 We went to the Lobby Barong to see many different types of fishes – even the piranha. Dot took some pictures of the ferocious piranha. After we checked-out, we were on our journey to Legian, where the surfers go. Our package include one night stay, one Safari journey, one photo-shoot with orangutan, entry to Bali Agung and breakfast. 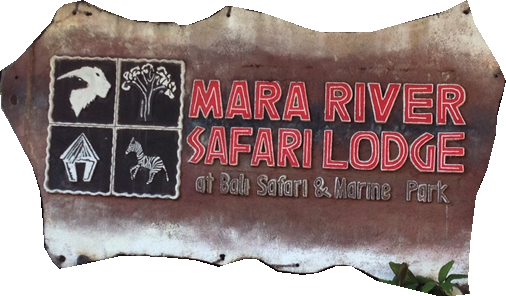 Service quality: We like the service of Mara River Safari Lodge – very personal,well organized and responsive. Dot vomitted all her milk and dirty the bed and the floor one night. Jay brought her to the bathroom and I quickly called the room service. In less than five minutes, two staff arrived and cleaned the floor and changed our bedding and bedsheet. We were very impressive with the prompt and good service. 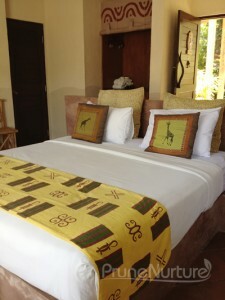 Swala deluxe room: Beautifully-decorated African themed room that pays attention to all details. Very comfortable and clean. Food: We enjoyed the pasta at Uma Restaurant, Balinese dinner and buffet breakfast at Tsavo Lion Restaurant. WiFi: WiFi is available in our room but not in the restaurants and park. Our best experience during our stay in Bali. A must-go destination especially for family with children. Thanks for this! My kids love animals so we might head there soon.